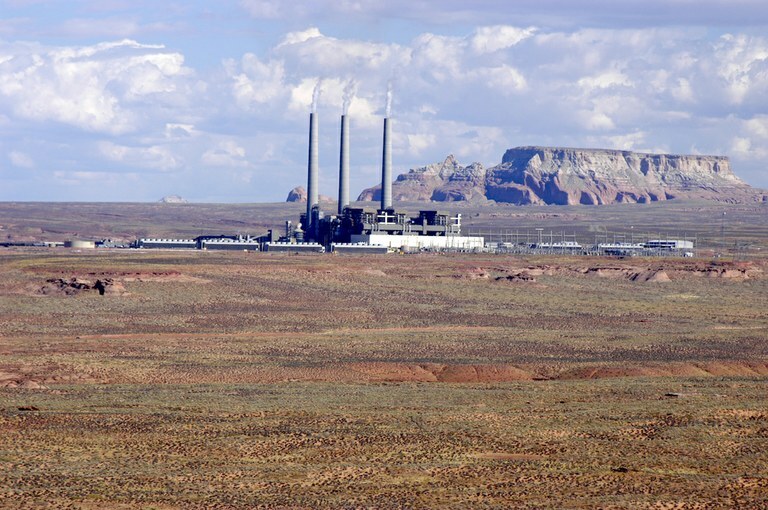 In one of the latest bids to save the Navajo Generating Station, the West’s largest coal-burning power plant, the Department of Interior has stepped in to try and stave off its closure. Last week, Timothy Petty, the Interior Department’s assistant secretary for water and science, sent a letter to the Central Arizona Project, a regional water utility, pressuring it to continue purchasing electricity from the power plant, which is slated to close in 2019. In the past, the water project, which is operated by the Central Arizona Water Conservation District, has purchased most of its power from the generating station. However, with the impending closure of the plant, the utility began looking to new and cheaper energy sources, including renewables like solar. On Thursday, despite the Interior Department’s recommendation, CAP’s board voted to sign a 20-year power purchase agreement with a solar company. The Navajo Generating Station, the largest coal-burning power plant in the West, is expected to close in 2019. Those working to save the plant fear that CAP’s decision to move forward with alternative suppliers will prevent any potential investors from coming forward to buy the generating station. However, the utility has said it will still consider purchasing electricity from the power plant if a new owner can “provide competitively priced power,” CAP spokeswoman DeEtte Person said in an email. The battle to keep the coal-fired power plant running is emblematic of a larger national effort to keep coal in operation, despite market forces that favor natural gas. As part of his “energy dominance” mandate, President Donald Trump’s administration has tried to bolster the country’s coal production, moving to lift regulatory burdens to increase the profitability of the energy source. Time and again those efforts have proven inadequate to save the struggling industry. Several attempts have already been made in the case of the Navajo Generating Station. In April, Arizona Gov. Doug Ducey signed a bill that would provide a multi-million dollar tax break for coal in Arizona, as a way to attract a potential buyer for the generating station. A few weeks ago, Rep. Paul Gosar, R-Ariz., revealed a draft bill that would require the operator of CAP to purchase as “much of its total power requirements as possible” from the station until the utility has paid off its $1.1 billion debt. In addition to that mandate, the bill would temporarily exempt any potential new owner of the plant from having to conduct a National Environmental Policy Act review, and would waive Clean Air Act requirements, according to AZ Central. If no buyer comes forward — a Chicago-based company has said it might make an offer — the plant will close in December 2019. The generating station supplies over 700 jobs, 90 percent of which are held by citizens of the Navajo Nation. In a statement, Navajo Nation President Russell Begaye asked for more time to find a buyer before utilities like the CAP pursue alternatives. “We should continue to work to find solutions to keep the plant operating while supporting both the Navajo economy and families,” he said. Both the Hopi Tribe and Navajo Nation also receive royalties from coal production, with 85 percent of the Hopi Tribe’s annual budget coming from the generating station. In the same week that the Interior Department put pressure on the Arizona utility to buy power from the generating station, a leaked White House draft memo directed the Department of Energy to save struggling coal and nuclear plants across the country. The memo described plans to order grid operators to buy energy from coal and nuclear plants for at least two years, allegedly to boost the resilience of the power grid, according to a statement from the White House. Despite a coal-friendly administration, Thursday’s vote for solar by the CAP board suggests that coal is no longer considered an economically viable option for future energy generation. Addressing representatives from both the Hopi Tribe and Navajo Nation at Thursday’s board meeting, CAP’s Board President Lisa Atkins stated that the utility was “not at war with coal.” Rather, it was seeking a “long-term, cost-effective, reliable and diverse power portfolio.” Coal, it would appear, no longer has a prime spot in that energy mix. Jessica Kutz is an editorial intern at High Country News.